Moon Garden Mystery Stitch-A- Long!!! A Moon Garden at night is a great way to enjoy white or light-colored, night-blooming plants, in addition to those that release their intoxicating aromas in the evening. White flowers and light-colored foliage reflect the moonlight…This is the concept that I have tried to follow here at Anchor Point when planning the flowers & trees..everything booms in white or shades of white. 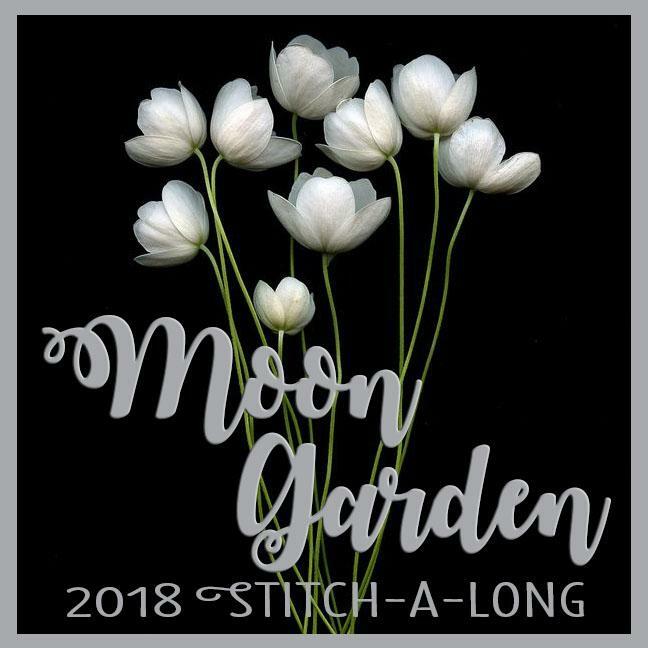 We have wonderful full moons over the lake so why not stitch a Moon Garden as well….lots of light-colored blooms on a dark backgrounds. The backgrounds I am using come from the Black prints of Little Gatherings I and II. Moon Garden is a 12 block basket BOM. The blocks are nice and big for easy stitching…I believe they will finish somewhere between 16-17″…I want to leave that option open until I have decided on a final setting…Plan on using a FQ for each block to start with…I have been searching for/and hoarding beautiful light wools for these blooms for a while now, and we will have lots of fun stitching and embellishing these. The patterns for Moon Garden will be Free on my blog for one month…until the next block is released. We will be giving you the PDF patterns that will need to be printed on 11×17 paper…so you will have to bring them to a copy place to be printed unless you are able to tile the design and print on 4 -8 1/2″ x 11 sheets. 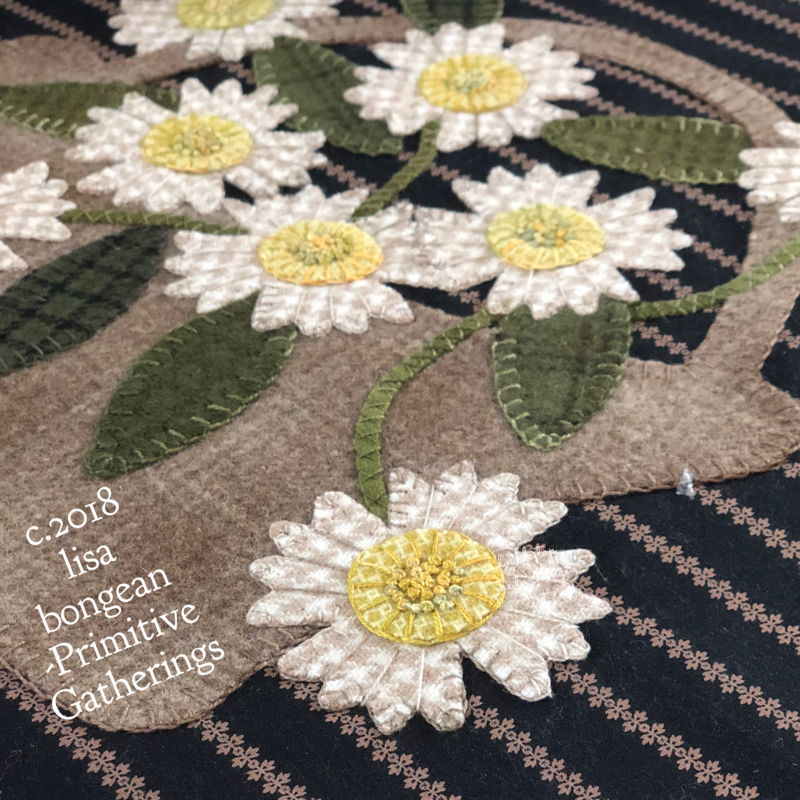 However we will be offering kits for those of you who love our fabric choices and want to support me/Primitive Gatherings for our hard work on this Stitch-A-long. 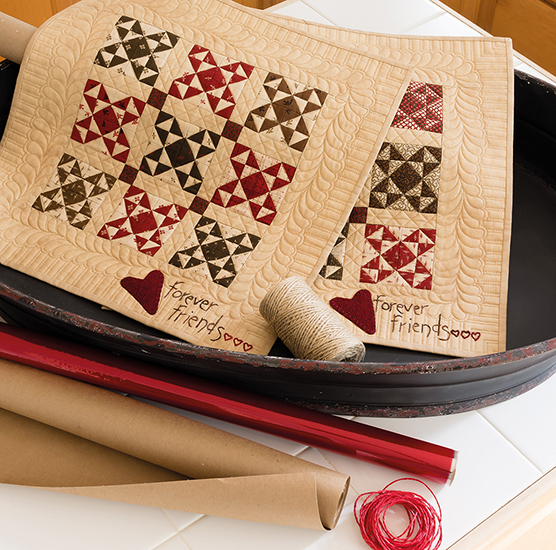 Our block kits WILL INCLUDE the printed pattern full size, therefore no need to have to have it printed elsewhere…The pieces are big…you will need lots of large medium to light brown wools for baskets…and so on…we will have a couple of options for you to purchase…please read carefully as they are listed below. The green highlighted words when clicked on take you to our site so you can order if you wish to do so. Again…we appreciate supporting our small family business, we can’t say that enough. If you are interested in the wool only for the blocks but NO cotton background we will still get you the 12th block FREE. The blocks will be: $23 with domestic shipping $29 for international shipping. 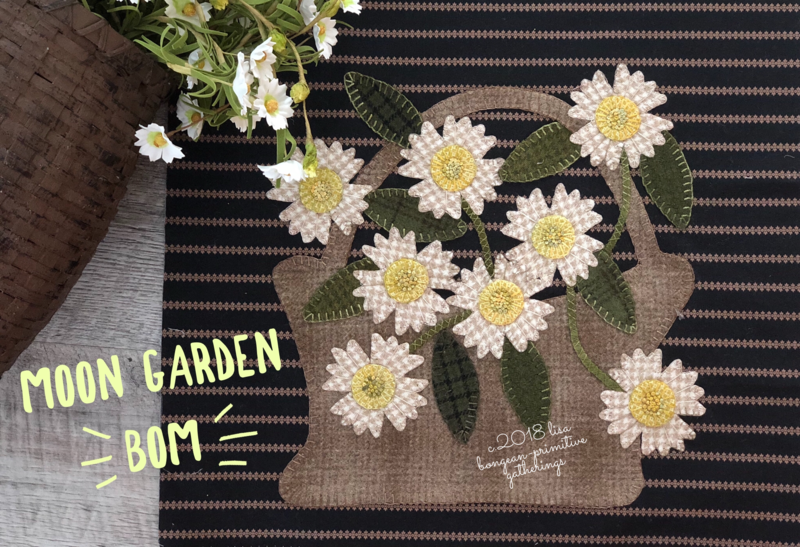 If you are interested in JUST buying the brown basket textures we have a bundle for that as well- you will have to have your patterns printed at the local print shop. The bundles are $115 w/domestic shipping $122- international shipping. The bundle shown is not the bundle you will receive, but just a picture so you get an idea. I will also try and have starter thread kit available soon as well. But without having all the blocks done you can see my dilemma…but maybe by the end of March I can have all the blocks stitched!! We obviously will be doing prizes as well if you get your blocks done each month as well as some other contests thrown in as well to keep it fun and interesting!!! Next Post Garden Mystery Block Blog Hop!!! This sounds wonderful and I can’t wait to get started! Will you still be doing your summer Block of the Week programs in addition to this year long program? 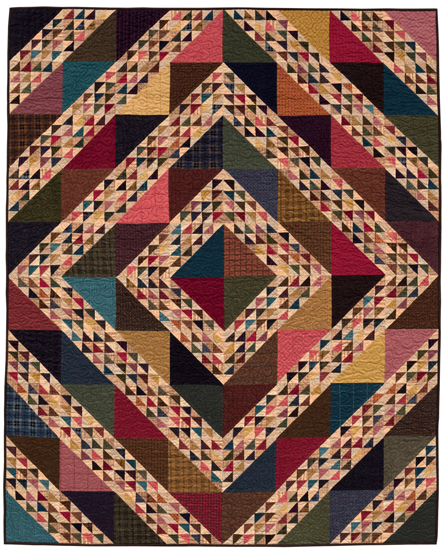 Sorry, I thought of another question…will you be giving stitching guidelines with the blocks? For instance, I am noticing that your daisies are stitched from one petal to the opposite petal, across the middle. That looks pretty tricky! Absolutely a beginner with wool applique, so I am thrilled with your planned BOM. I’m so glad you are doing a wool BOM. I’ve been waiting!! I can’t wait to get started & add this to my Lisa Bongean collection. Lisa, have followed you since Blockheads … your work is so beautiful and inspiring! Have wanted to do wool for sometime so this is a great opportunity. Thank you so much! 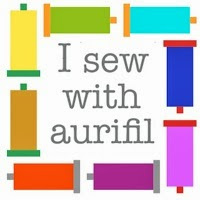 Am signed up and would definitely be interested in a thread set. Also, your suggestions on fusible for the wool. How can I sign up for the moon garden mystery sal? I, too, love to plant Moon Gardens. 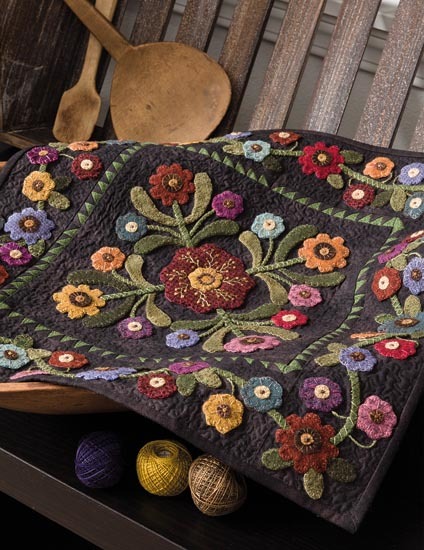 This BOM looks like a good project to learn both wool applique and embroidery stitches. Just completed ordering. Love your designs, Lisa. How do I sign up for the moon garden mystrey SAL? Lisa – Can you give us an approximate size of the baskets so that we can determine what we need to order? Sounds wonderful… how do we sign up? Hello! I can’t seem to find the fb group page.. have you started that yet or are you waiting until april? These look as if they will be just as wonderful as always!!!! I’m still waiting for a setting for the 100 Primitive Triangles from Lisa, too — or did I miss it??!! Thanks so much —— I have 100 gorgeous blocks calling out!! I didn’t order the thread kit when I signed up…is it still available? I don’t see it on your website….thanks! Can’t wait for this! Where can I find the pattern for Blk 1 of Moon Garden ? It will be on our blog here soon! !